Favorite Color: Blue. Light blue, dark blue, bright blue. 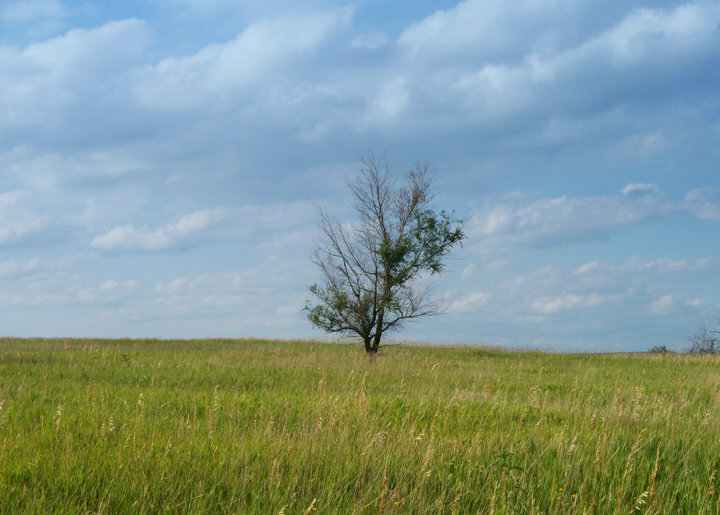 I also love the combination of a blue sky with a few thunderheads drifting over an asphalt road surrounded by prairie in late summer – such a bright mixture of blues, greens, and yellows. Tree along the Missouri River south of Bismarck, North Dakota. Favorite Animal: Jellyfish. And penguins. Possibly lab rats. I would love to get a pair and teach them tricks, but my cat, Sappho, would probably eat them. 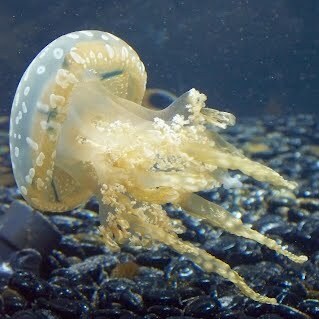 I plan to be reincarnated as a jellyfish. Actually, no, she wouldn’t. She’s old and fat (the vet politely said she’s a “full-figured lady”), and if she can’t be bothered to catch the chipmunk living in the front flowerbeds, I doubt she’d go for a rat either. Favorite Number: 17 and e. Whenever I crochet a blanket, I use e for my sides ratio. Favorite Non-Alcoholic Drink: Iced tea, unsweetened because I’m a Yankee. Facebook or Twitter: Twitter for writing stuff, Facebook for real-life stuff. Your Passion: Road trips; I would live in my car if I could. And education equality. I start grad school in a couple weeks, going for a master‘s in social work, and today my adviser suggested I go for a school social work endorsement, to which I said, “More classes? Hell yeah, sign me up.” I’m slowly writing my students’ stories, and some day I’d like to publish a big collection of them. Giving or Getting Presents: Giving. I don’t like getting them, actually. I especially like giving them as guerrilla acts of kindness. Favorite Day: I tend to be really phlegmatic and don’t get excited about much, including days: Saturdays, birthdays (I prefer to not even acknowledge my birthday, not because I worry about getting old but because it’s just another day), Christmas, etc. Days are days. Favorite Flowers: I love blue hydrangeas. And the massive sunflower fields in North Dakota in late summer. And once again, I’m tagging everyone who reads this. Ha!